Bloor-Yorkville BIA Wins TABIA Award for Beautylicious! You are here: Home / Bloor-Yorkville BIA Wins TABIA Award for Beautylicious! It may not have the glamour of the Oscars, but we won! 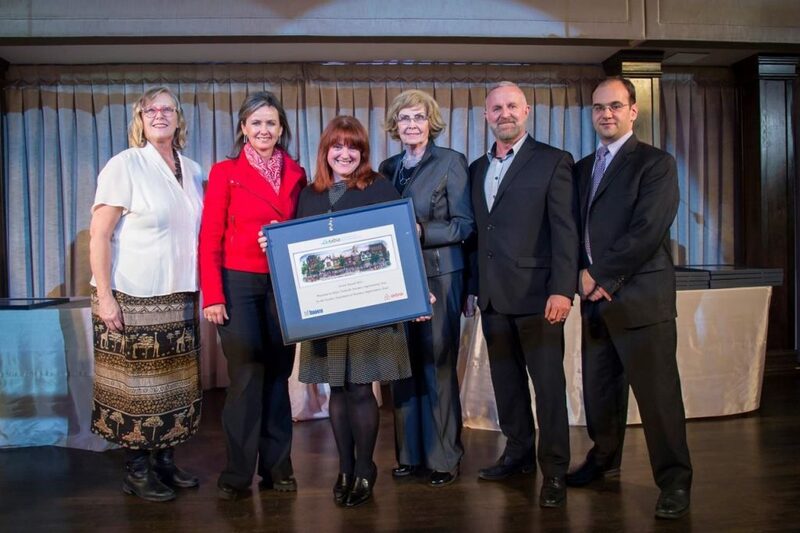 Early in December, the Toronto Area Business Improvement Association (TABIA) held the 6th annual Awards Night. The evening dinner and ceremony recognizes and awards many of Toronto’s 82 BIAs for their efforts to improve their communities throughout the year. Thirty-seven awards were handed out to deserving BIAs, in 13 categories, to include Murals, Community Engagement, Environmental Initiatives, Branding and Creative Solutions. To the applause of the crowd, Bloor-Yorkville BIA staff and Board members made their way to the podium to receive the Events award for Beautylicious. Our BIA also received a recognition certificate for 30 years of service. Beautylicious is a one-of-a-kind event, celebrating Bloor-Yorkville’s 130+ salons, spas and wellness centres. Designed to reinforce Bloor-Yorkville’s reputation as a powerhouse in the world’s dynamic beauty industry, the concept was built on the idea of making our member’s health and beauty services inviting to all, with introductory offers to entice new customers. Inspired eight years ago by Toronto’s annual Summerlicious/Winterlicious prix fixe dining event, Beautylicious offers consumers the opportunity to experience an array of hair, spa, skin and health and wellness service packages for women and men at “prix fixe” prices of $30, $50, $75 and $125. Over 58 members of the Bloor-Yorkville BIA beauty sector participated in this 10-day event, which resulted in well over a thousand appointments and millions of media impressions. As well as outstanding media coverage through various print, radio and online formats, the social media impact was equally impressive. The event contests, for both radio and Facebook, offered exceptional prizes from our salons, and created a significant buzz. Focussing on a niche market of consumers that appreciate beauty, health and wellness, Beautylicious has always been a very successful event in driving media attention to the Bloor-Yorkville area as the premier beauty, health and wellness area of Canada. This year TABIA put Beautylicious in the spotlight. In the past, the Bloor-Yorkville BIA has won TABIA awards for Outstanding Floral – Planters on Bloor Street (2012), Streetscape – Unit Stone Paving Project on Yorkville Avenue (2015), Events – Pride of Bloor-Yorkville; Yorkville Exotic Car Show; and IceFest (2014). It may not have had a red carpet, but the Bloor-Yorkville BIA can be proud to have Beautylicious recognized for an outstanding performance!